Schlitterbahn Water Park is a family-owned water park that originated in Texas. 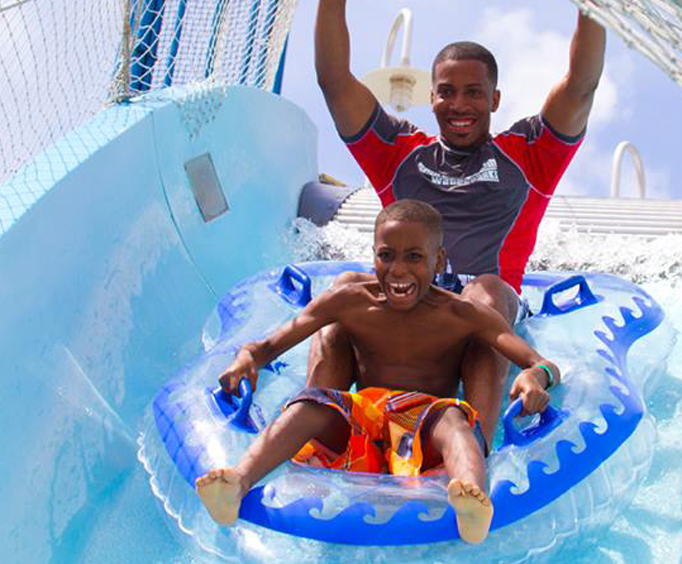 With more than 35 exhilarating water rides and attractions, Schlitterbahn draws guests from all over the country. Check out the rides below to see if you're willing to take on their challenges! Bahnzai Pipeline: With three different body slides, you can try all different kinds of ways to go down and land in the splash pool below! Blastenhoff Heated Pool: This heated pool is the perfect spot to relax and enjoy a frozen beverage at the swim-up bar! Boogie Bahn: Don't forget a bodyboard so you can surf some realistic waves! Cliffhanger: You'll find that this ride definitely lives up to its name as you free fall down 81 feet at speeds of up to 40 miles per hour. Dragon Blaster: You won't know what's going on as these two slides take you up and down big drops and through a series of tunnels and twists! Faust Und Furious: You'll start at 60 feet in the air and travel through a steep spiral with these two slides as you race downhill. Guanda Loopy: Grab a tube and take the 390-foot enclosed journey through darkness until you end up in the waters below. Kristal Bay: Grab a tube and float along the river, or relax along the beach of the Kristal River! Kristal Beach: This beach is the perfect place to lay out and relax while you take a break from all the chaos surrounding you! Kristal Cove: Another place to relax, the Kristal Cove is a more quiet beach along the Kristal River. Kristal River: This lazy river is sure to help you relax as you drift along. Loopy Luge: Your adventure begins 40 feet in the air as you twist and turn your way down these enclosed slides! Rohr! : Standing at 70 feet tall only means you will reach top speeds of 30 miles per hour as you body slide your way down! Shipwreck Harbor: Catch some rays, splash and play, or enjoy a picnic lunch at this great attraction! Soaring Eagle Zip Line: You'll be pulled backwards 100 feet above the park with this ride before lurching forward at 30 miles per hour! Thunder Tub: You and two others will be able to enjoy this tube ride together as you experience three different falls before splashing in the waters at the end. Tiki Tikes: Just for the tikes, this play area is the perfect spot for kids to slide, spray, and play in a shallow water pool. Torrent Beach: Where the Torrent River meets the beach, this area will be the perfect place for you to run and play around! Torrent Beach Kids Area: Let the kids run at these two areas that include three slides. Torrent River: This river is anything but lazy! Tidal waves will break without warning as you float around the River. Treasure Island Kids Pool: Send the little ones to Treasure Island for slides and sprayers that will keep them busy! Wasserfest Heated Pool & Swim-Up Bar: Swim up and grab a cool beverage in this 1,100-square-foot heated pool and swim-up bar. Wasserfest Kids Area: The younger adventure-seekers can let loose and play in this huge activity pool. Wave Lagoon: Here you can relax in the shade or lay out on the beach before getting back into the water! Whitewater Beach: Another lounge area, Whitewater Beach is perfect for families looking to wade in the ripples of the waves from the river. Whitewater Cove: This beach will get you out of the craziness of the water slides as you unwind in its light waves. Whitewater River: As you drift through the rapids and white waters of the Kristal and Torrent Rivers, you will be able to float through the entire park, never even leaving the water! Wolfpack: Grab two others and a tube before taking this adventurous slide on! After your day at Schlitterbahn, you will want a nice hotel room to return to. With plenty of wonderful hotels, you're sure to find just the hotel room you need. Don't miss this incredible inclusive opportunity to get away from your everyday life and take an amazing adventure in Galveston, Texas!